This morning's Oregonian has a short obituary of Dr. Edward E. Rosenbaum, MD, OHSU professor and chair emeritus of the Dept. 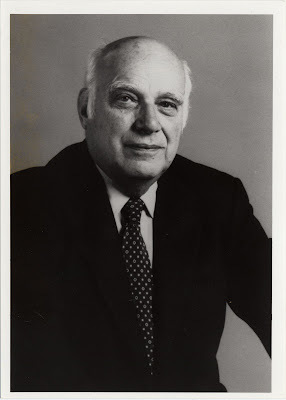 of Rheumatology and nationally known author of A Taste of My Own Medicine, who passed away yesterday at the age of 94. Part of one of Portland's most prominent medical families, Edward practiced medicine with his brother William, an internist; three of Edward's sons and two daughters-in-law became physicians, as did two of William's sons. Despite his close association with the profession, Edward was ultimately unstinting in his criticism of the modern practice of medicine. His book, which served as the basis of the screenplay for the film The Doctor, recounts Edward's experience as a patient with throat cancer--an experience that radically changed his perspective on what it takes to be a good physician. Edward's impressive resume included fellowships at Michael Reese and the Mayo Clinic, military service in World War II with both a mobile surgical hospital and the Women's Army Corps, a long and distinguished academic career at OHSU as the state's first specialist in rheumatology, and a private practice that served all patients regardless of financial status (it has been widely reported that the Rosenbaum brothers often wrote off as much as $40,000 in bad debts annually). Education and clinical experience alone could not teach Edward what his grandmother had known instinctively: "Doctors are great--as long as you don't need them." His turn in the role of patient provided Edward with insight into the perspectives of the ill, and it radically altered his own perception of the role of the physician. "I've switched sides," he declared. And we all--physicians and patients alike--are better off for it. I read his book. He was an extraordinary man. May he rest in peace. I read his book and am glad to see that Dr. Rosenbaum beat his cancer and lived well into the new millennium. He set high standards as both a physician and a writer. I am re-reading Dr. Rosenbaum's book for the second time. I am a family physician and I believe I will be a better physician for reading his story. It is a tremendous book and highly recommended.